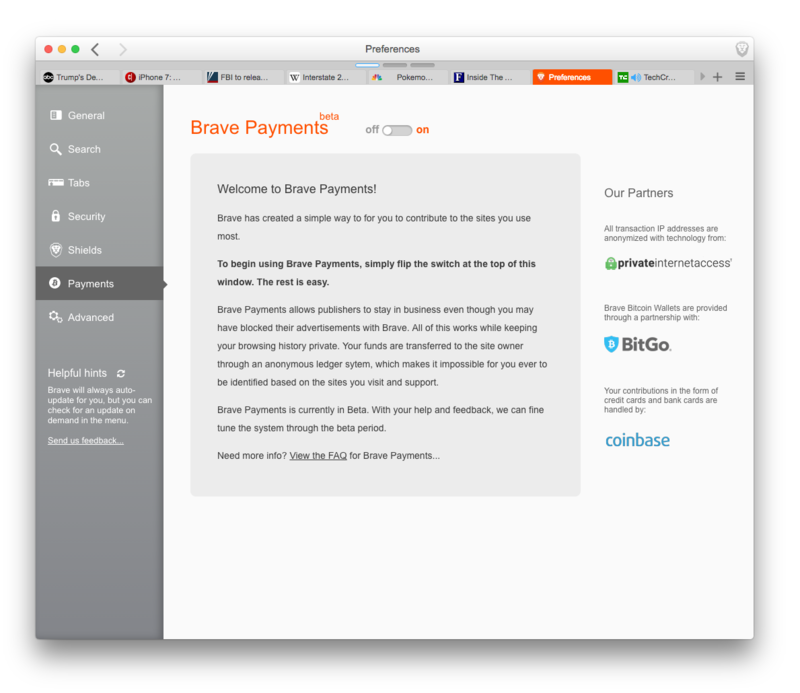 Users simply need to turn on Brave Payments from within Brave’s preferences page, then fund their Brave wallet (either with Coinbase, or by using Bitcoin they already have), and then browse as usual. While everything is automatic, once enabled, the Brave Payments UI allows you to control which sites receive your support by manually enabling or disabling funding for any of the sites you visit. All of this analysis is done without disclosing your identity, via the Anonize protocol over the network and via statistical voting on-device, so that neither Brave Software, Inc., nor any other entity can correlate browsing page views with payments. Publishers simply collect their aggregated donations after authenticating themselves. What’s more, all of the Brave Payments code is open source, to support verification and auditing. We’ve heard from many people who say that they are tired of the current ad-tech ecosystem that clogs their web pages and data connections with annoying ads and tracking pixels and scripts, and that they would be happy to go ad-free if they could instead funnel their support directly to the websites they visit. Brave Payments now makes it possible for such users to try sending small payments to sites, at whatever aggregate support level they choose. Some will start with $5 a month, some more. You shouldn’t have to pay anything to avoid bad ads, of course – but if your favorite sites rely on ad revenue, now you have a way to help them all, efficiently and privately, while blocking ads. We are excited to partner with BitGo, to support the per-user Brave wallets that hold your Bitcoin-denominated funds for making Brave Payments; with Coinbase, to make it easy for all users to buy Bitcoin from within Brave via the Coinbase Buy Widget; and with Private Internet Access, to mask the Internet Protocol (IP) addresses of our users from our own servers. Standardizing anonymous micropayments will take years of effort before something cross-browser can be added to the Web’s specifications. However, by integrating Bitcoin under-the-hood with Brave Payments today, along with the faster and more secure ad-free and tracker-free browsing already in Brave, we hope to gain enough loyal users so that, with your help, we can collaborate on a truly private (even decentralized) eventual standard for web payments. We believe Brave Payments will also help reform the ad-tech ecosystem by giving both browser users and website content creators the fair deal that they deserve, based on ownership of their data. This is just the first step along a path that should offer users a revenue share for their attention, if they so choose, where that share will come back to the user’s Brave wallet. For those of you wishing to find out more about how we implemented deterministic anonymity and statistical voting with fairness for all sites, please check out our Principlesand Practicals documents on GitHub. Brave Payments is in beta, so we’d be grateful for your feedback and suggestions as we fine-tune it. Please email support@brave.com with comments, or if you’re a developer, jump into contributing via GitHub.